Ben & Jerry's new flavor, EMPOWERMint, is peppermint ice cream with fudge brownies and fudge swirls. As you enjoy your first delicious spoonful, with all that fat and sugar tickling the pleasure centers of your brain, you might notice something funny about the cow mascot on the pint container. The cow is standing behind a placard that reads "Democracy Is In Your Hands," and it's holding a sugar cone topped with the rotunda of the U.S. Capitol. That's because EMPOWERMint is also the latest move in the company's four-decade campaign to give a voice to the voiceless. Ben & Jerry's is donating proceeds from sales of their new flavor to the North Carolina chapter of the NAACP and their fight against restrictive voting laws. "I’m excited that we’re working with some amazing partners who are experts in the issue of voting and democracy," said CEO Jostein Solheim. "We want our customers to help us get the Voting Rights Act reauthorized, because democracy doesn't work unless it includes all voices." "We're very thankful that Ben & Jerry's sought us out," says The Reverend William Barber II, a NAACP board member and chairman of the North Carolina chapter. "They understand that attacks on voting rights are also attacks on the living wage, LGBT rights, access to health care, and the whole strategy of building coalitions to advance the progressive agenda. It's a sad fact that African-Americans in North Carolina have fewer voting rights now than we did in 1965." Three years ago, the Supreme Court gutted the Voting Rights Act of 1965 by removing a requirement that eight Southern states, Alaska, and some cities get Federal approval before changing their election laws. Several states quickly passed laws that require voters to show IDs, restrict early voting, and similar measures making it harder to cast ballots. North Carolina's new laws were among the strictest. 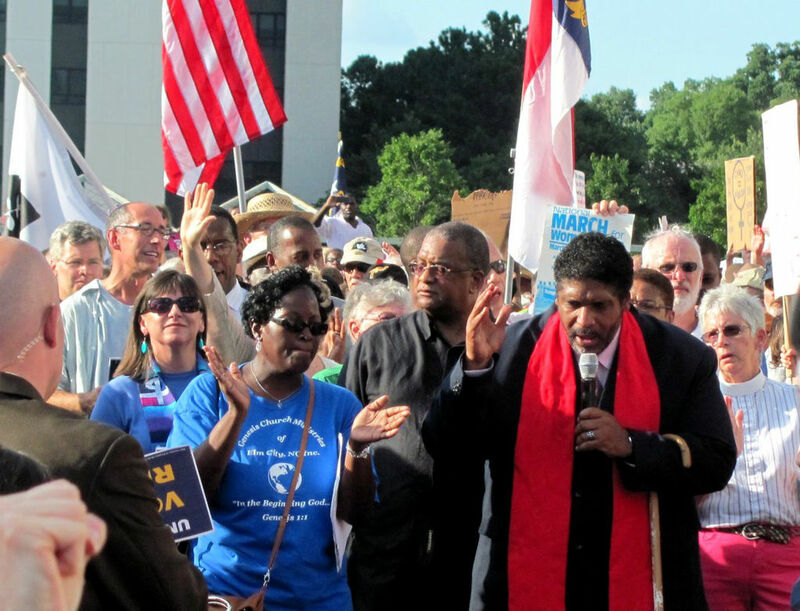 The NAACP is challenging North Carolina's laws with voter education and get-out-the-vote campaigns; a lawsuit; and the Moral Mondays protest movement, which began in North Carolina and is spreading across the South. Ben & Jerry's is based in South Burlington, Vermont. It's a long way from the Greenleaf Christian Church in Goldsboro, NC, where Barber serves as pastor. In Vermont, 93 percent of the population is white, a state holiday called Town Meeting Day celebrates direct democratic engagement, and Jim Crow laws are just a historical oddity. At the urging of the company's independent board, which guides its social mission, Ben & Jerry's began a "learning journey" 14 months ago by inviting racial justice activists to meet employees at company headquarters. Last October, CEO Solheim, board members Jeff Furman and Daryn Dodson, and activist manager Chris Miller met with Congressman John Lewis. This year, the company has come out in support of same-day voter registration, mail-in voting, and mass protests like Democracy Awakening, a three-day action at the US capitol. The action culminated with the civil resistance arrests of hundreds of people, including company co-founders Ben Cohen and Jerry Greenfield, Furman, and fellow board member Annie Leonard. Ben & Jerry’s has been speaking out like this for 38 years, and their politics are a core element of their beloved brand. They know that taking forthright stands on controversial issues will offend some potential customers. But moves like these also make loyal customers even more loyal while generating tons of free publicity (like this post). "So my investment in this issue is, quite literally, an investment," he wrote last month. "Our business and most other companies do best when the American people do well. We could call it trickle up economics." Brad Edmondson is the author of Ice Cream Social: The Struggle for the Soul of Ben & Jerry's (2014).